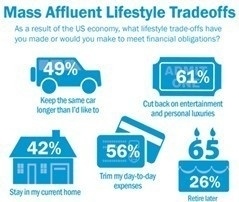 According to the Summer 2012 Merrill Edge Report, many mass affluent Americans are willing to make short-term sacrifices in order to get their finances in better shape. The report, released on April 26 by Bank of America, explores the financial concerns and priorities of mass affluent consumers, Americans with $50,000-$250,000 in investable assets. This group, which consists of approximately 28 million households in the United States, has also shown over the last six months a rising concern over a number of financial issues, such as the cost of healthcare and being able to afford the lifestyle they want in retirement. According to the findings, 70 percent of mass affluent Americans say they took on home improvement projects in the last year, such as plumbing, painting, and home cleaning, that they would normally hire someone else to do. Younger members of the mass affluent segment were more likely to embark on these home improvement projects than their older counterparts. 84 percent of 18-34 year olds took on a project compared to 77 percent of 35-50 year olds and 60 percent of those aged 65 and older. Other methods this group will utilize in order to meet financial obligations include cutting back on entertainment and personal luxuries (61 percent), trimming day-to-day expenses (56 percent), and keeping the same car longer than they’d like to (49 percent).